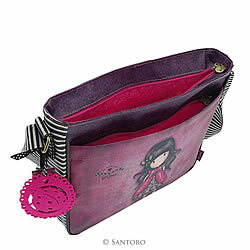 The bag features a zipped compartment on the front which is lovingly lined with a beautiful print. In the main compartment your goodies will be encased in the same lovely lining, with a secure zipped pocket for your valuables. 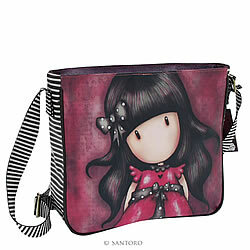 This cute cross body bag can be carried by the gorjussly striped strap which is secured with pretty stitching detail and is adjusted by a belt-style buckle. 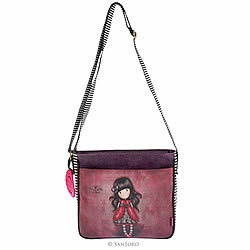 The bags finishing touches include a branded label and embossed detail. Note: These Bags should be kept away from fire. 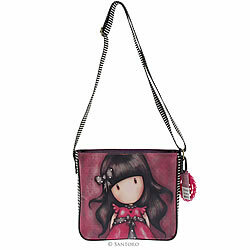 Each Gorjuss bag is hand-finished and as a result colour and detail will vary from piece to piece. Please be aware of colour transfer if rubbed against a lighter coloured fabric. Measures: 11" x 9.8" x 3.1"